The earliest collector of art objects in the territory of the Slovak Republic was poet, polymath and physician Jan Sambucus (1531-1584), a native of Trnava. By the 18th century collecting was implemented along two lines. One involved collection by rich townsman and aristocrats. In the 18th century, Prince Albert of Saxony-Cieszyn created a large collection of art-historic items in Bratislava which became the foundation of the contemporary Vienna Albertina. Several aristocratic families, including notably the Andrassy, the Palfy, the Csaky and the Forgach, also had family collections. The second, based on the ideas of the Enlightenment, was constituted by the efforts of scholars, grouped into associations, who created collections and antiques and made them accessible to the general public. The origin of school collections (the Mining Academy in Banská Štiavnica and the grammar schools in Bratislava, Košice (1769) and Prešov (1846) were inspired by similar ideals. Collecting in Hungary culminated in 1834 with the establishment of the Magyar Nemzeti Múzeum in Budapest, whose collecting activities also related to Slovakia, which was then still part of Hungary. In the 1870s the first legal regulations codifying the protection of cultural heritage were adopted. When various scholar associations were created in Hungary at the beginning of the 19th century, the national-emancipation efforts of Slovak scholars and their efforts to find confirmation of the cultural maturity of the Slovak nation and its right to national independence began to be expressed by means of ‘collecting antiques’ . With the establishment in 1863 of Matica slovenská, which strove for the development of scientific research and support for national cultural life in Slovakia, an institution was created which professionally collected and saved objects of material and spiritual culture with the goal of creating a museum. Soon after this the foundations of national museology in Slovakia were laid with the establishment in 1893 of the Slovak Museum Society. The first building of the Slovak National Museum opened to the public in Martin in 1908. Andrej Kmet, doyen of Slovak museology, played the pioneering role. Before 1914 a total of 21 museums operated in Slovakia; they were founded on the association principle and were partially supported from state sources. Private, especially aristocratic collections, such as those at Krásna Hôrka Castle, Červený Kameň Castle and Hodkovce Mansion, existed alongside them. Qualitatively, new conditions for the multilateral development of culture in Slovakia were created upon the establishment of the Czechoslovak Republic in 1918. The state began to finance the largest and best selected museums: the Eastern Slovakia Museum in Košice, the Slovak Historical and Geographical Museum and Agricultural Museum in Bratislava and the Mining Museum of Dionýz Štúr in Banská Štiavnica. The Slovak National Museum, which strove for nationalisation in the 1930s, also received regular financial subsidies. Some museums were members of the Union of Czechoslovak Museums, which was established in 1924 with the goal of unifying museum activities within the framework of the entire Czechoslovak Republic (the first Czechoslovak Republic 1918-1939) and defining the area and range of collecting activities of every museum. Most of the 30 museums operating in Slovakia during the inter-war period were of a regional character, while three (in Martin and Bratislava) were national museums. 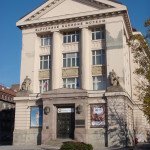 In 1933 the Slovak National Museum Gallery was established on the premises of the Slovak National Museum in Martin with the goal of capturing the development of fine arts from ancient times up to the present. Gallery collections were also opened for the general public at the expositions of the Slovak History and Geography Museum in Bratislava. The first national museums (Banská Bystrica, Liptovský Mikuláš, Rožňava) were also operational by this time. During World War II the situation had not significantly changed. The network of museums was widened with the addition of museums in Žilina and Zvolen. However, the destruction of the final years of the war had a negative impact on all museums – many collections were destroyed or lost for good. Only after 1948, upon the transfer to the so-called ‘peoples’-democratic system’, did changes in the organisation and management of museums take place in Slovakia, The nationalisation of museums began with the establishment of the Communist regime. During the 1950s all associations and professional organisations (the Union of Czechoslovak Museums, MSS, etc.) were closed down for ideological reasons. The state authorities, especially the national committees, took over the founder’s competence towards museums and galleries. In 1948 the Slovak National Gallery was established as a specialised museum institution for documenting the history of fine art in all time periods and forms of expression. Thereafter other galleries, or fine art museums, were also established alongside the model of the Slovak National Gallery (the East – Slovakian Gallery Kosice, the Liptov Gallery of Peter Michal Bohun, Liptovský Mikuláš, the Central Slovakian Gallery, Banská Bystrica, the Saris Gallery Presov, Bratislava City Gallery). Gradually, galleries were established in Poprad, Nitra, Dolný Kubín, Trenčín, Trnava, Žilina, Nové Zámky, Lučenec, Čadca, Senica, Martin and Spišská Nová Ves. Through their activities, along with the documenting of fine art, the galleries affected the development of fine arts in Slovakia by organising creative meetings of artists (the biennale of graphic art, the triennial of wood carving and engraving, ceramics symposia, etc.) The nationalisation of museums, the establishment of new museums and galleries under the auspices of the state and their direct link to the state budget guaranteed the finances for museum activities. However, at the same time it resulted in the massive penetration of ideology into their activities. Moreover, many historical objects found their way into the administration of museums and galleries and were reconstructed for their needs. The development of the school system after 1948, especially tertiary education, ensured the training of qualified specialists for museums and galleries, thus improving the conditions for professionalising museum activities within the framework of the entire Slovak museum network. However, under the leadership of the Communist Party, and for ideological reasons, the state frequently and negatively interfered in the purchasing activities of museums and galleries (preferring the purchase of collection items connected with the history of the revolutionary movement of workers and the Communist Party or created in the spirit of socialist realism). Eespecially in the field of presenting activities (demanding a focus on exhibitions about achievements in building socialism, or exhibitions of work by artists working in the spirit of socialist realism), museums and galleries had a role to act as workplaces for propaganda in the intentions and spirit of the governing ideology. At this time the state also strove to confirm the existing status of museums through legal regulations. The founding of museums and galleries was fully in the competence of various levels of state administration, which confirmed the state control of their activities. The newly-formed Slovak National Museum (which came into being as a result of the merging of the Slovak National Museum in Martin and the Slovak Museum in Bratislava), the Slovak National Gallery (SNG), Bratislava, the Museum of the Slovak National Uprising, Banská Bystrica and the Slovak Technical Museum, Košice were all founded during this period based on law. Efforts for creating a unified registration of collection items, and establishing the same terms for handling collection items connected with the acceptance of new scientific knowledge and methods in the expert protection of collection items, were also positively projected into the activities of the majority of museums and galleries at this time. At the beginning of the 1970s, the quantitative approach to the development of museums and galleries was abandoned in favour of specialisation into selected scientific disciplines and areas of human activities. In this way a network of historical and geographical museums and regional galleries was established with the goal of achieving comprehensive museum documentation of Slovakia. The efforts of the governing political elites to use museums and galleries to confirm their policy and power were also behind this. But not all museums and galleries had suitable conditions for building specialised collections within the framework of existing historically and geographically oriented collections. By the end of the 1980s there were 61 independent museums with 20 branch offices in Slovakia, administering more than 6.7 million pieces of collection items. In 1989 a total of 18 galleries with two branch offices operated in Slovakia, administering more than 140,000 collection items, representing all fine art disciplines, including naive art, industrial design and the history of architecture.